Initially System 7.0 had been regarded as a rather stable operating system in its own right, though cracks were showing as time progressed. Mediocre multitasking capabilities, conflicting third-party system extensions, and memory management woes were not providing any favours. The system architecture was hitting a brick wall, having largely been kept the same for 10 years. 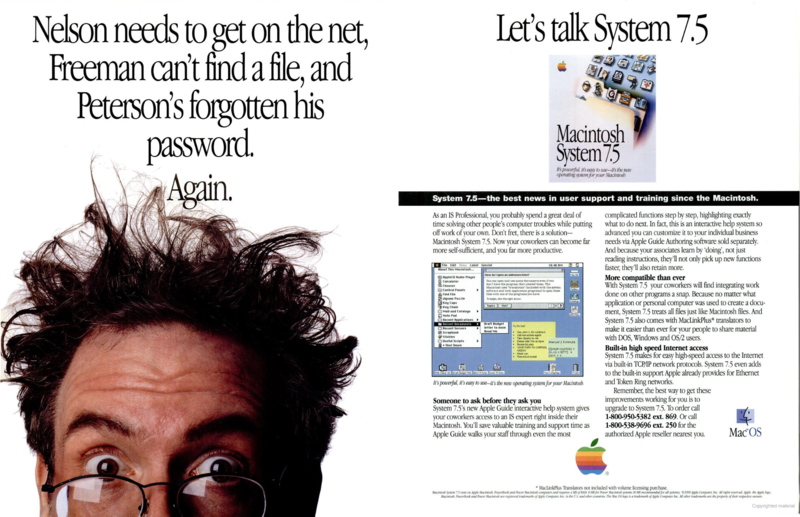 Apple’s Macintosh System 7.5 was released in 1994, three years from the previous major version, System 7.0. 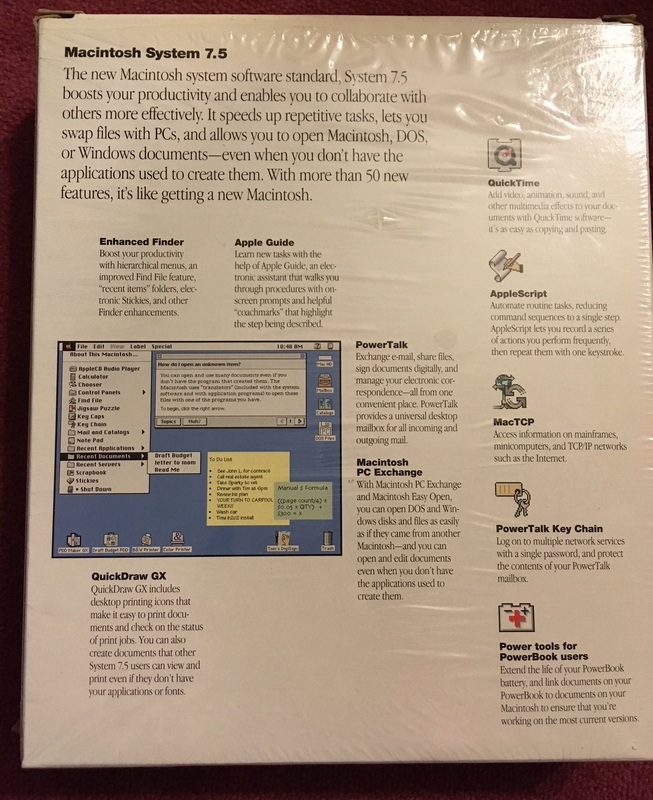 Whilst several versions were released in between, these were for the most part minor tweaks and provided additional support for new Macintosh models as they came along. 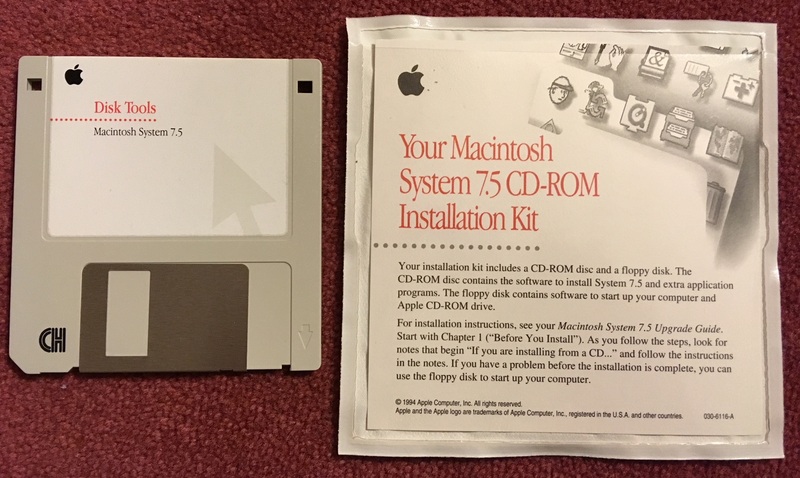 In hindsight, upgrading from System 7.0 to 7.5 held a similar user experience as from Windows 95 to 98. Side-by-side the changes appeared subtle, though just enough to feel it wasn’t just the same as before. 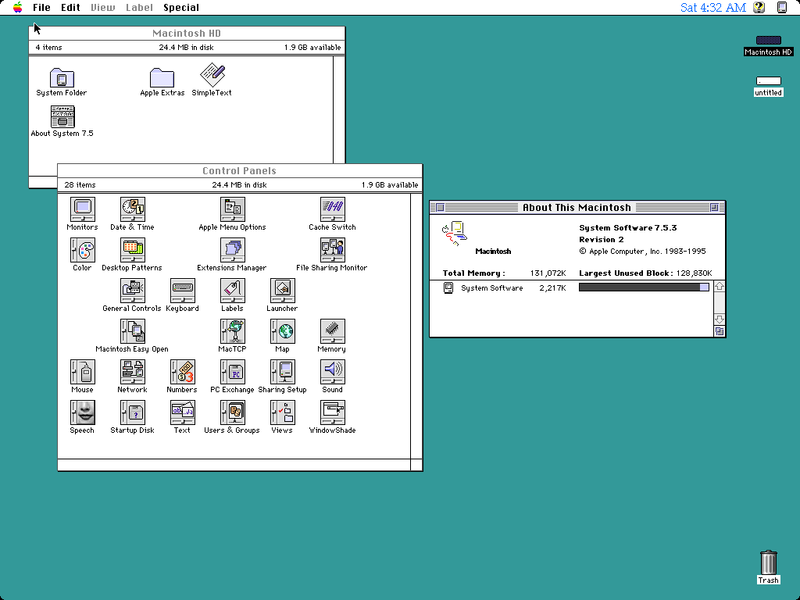 A fresh install of System 7.5.3. 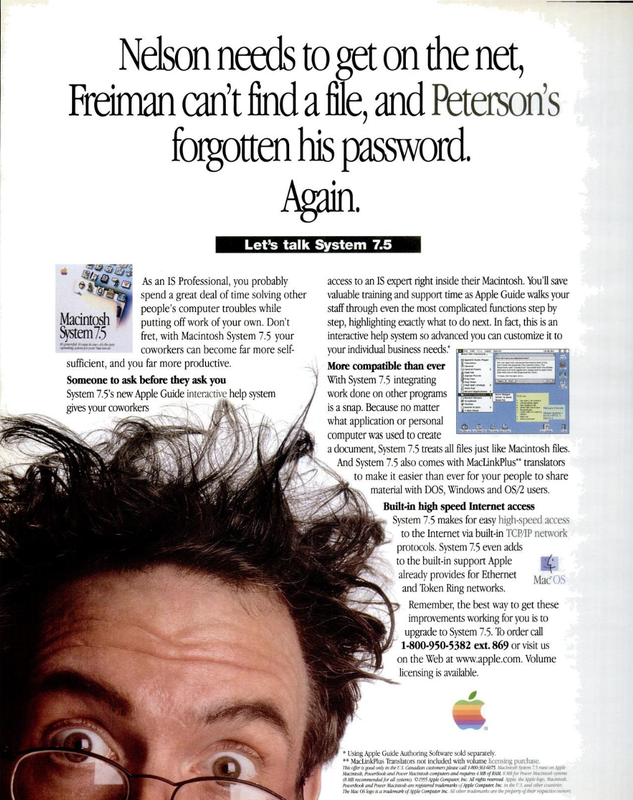 Singe page advertisement from InfoWorld magazine, June 1996. Double page advertisement from InfoWorld magazine, December 1995. Apple’s website back in 1996 listed 50 new features and improvements. The following isn’t the complete list, though covers the more interesting functional enhancements as how Apple advertised them. 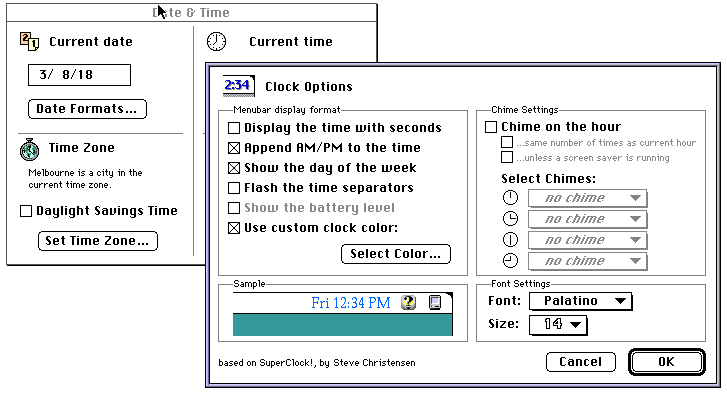 Some of these such as WindowShade, Stickies, and the Menu Clock Bar were third-party utilities developed for System 7.0, that Apple purchased the rights for. Apple Guide – A whole new kind of help system that features active assistance. Walks you through any task one step at a time from start to finish, so you learn by doing. Macintosh Drag & Drop – Bypass the Cut and Paste commands. Now with drag-and-drop-savvy applications, including the Note Pad and Scrapbook, you can simply drag graphics, text, and sound within a document, between documents, between applications, or to the desktop as “clippings” files. Scriptable Finder – Automate routine and repetitive system tasks with scripts that save you time and help you avoid mistakes. Enhanced Apple Menus – The Apple Menu now features hierarchical sub- menus so you can quickly access your Control Panel items and your most recently used applications, documents, and servers. Faster Than System 7.1 – Snappier than ever, 7.5 offers users improved performance when they copy files, launch and switch applications, and access menus. WindowShade – Cut down on screen clutter – a simple double click on any window’s title bar and zip, the window disappears to give you access to information behind it. 4 Gigabyte Volume Support – System 7.5 doubles the volume support size from 2 gigabytes to 4 gigabytes so users can store large data, documents, and files in one place. Finder Hiding – Use the Desktop Hiding feature to keep novice users from becoming confused when they click outside an applications and find themselves on the desktop. Launcher – Improve your productivity by keeping your frequently used applications, documents, and folders in a special floating window for quick access. Recent Items Folders – Quickly access recently opened documents and applications through a hierarchical Apple menu. Default Folder For Saving Files – Automatically save newly created documents to a central folder on the desktop so you can find them easily and spend less time looking for them later. Electronic Notes – Easily make and post notes to your desktop in a variety of colours. Remind yourself of key meetings, phone calls, or important dates. Print or mail your memos with Macintosh Drag and Drop. New Scrapbook – Now you can change the size and dimensions of the Scrapbook. And when working with drag-and- drop-savvy applications, simply drag items directly from the Scrapbook without cutting and pasting. New Note Pad – A resizable Note Pad offers increased functions like printing, find file, and support for Macintosh Drag and Drop. Make and store notes of up to 32K each. Menu Bar Clock – Display day of week and date in menu bar in a variety of fonts and colors. Toggle with a double- click between date and time. System/Application Folder Locking – Lock your System and application folders to keep novice or young users from deleting files, making unwanted changes, or “storing” things in the Trash. Improved Stability – A more stable system that means fewer bugs, bombs, and crashes for today’s Apple computers. New Audio CD player – New Apple menu item offers you easy access and full control for playing and programming audio CDs. Sound Manager 3.0 – Enjoy 16-bit stereo-quality sound for all your multimedia applications, CD-ROM packages, education software, and more. 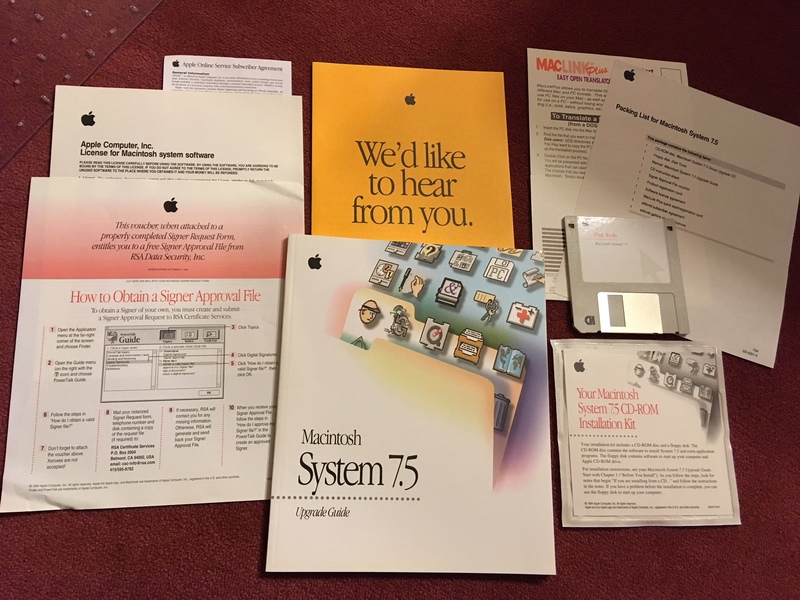 Macintosh PC Exchange and Macintosh Easy Open – These powerful utilities are now built into System 7.5 to make it easier than ever for you to exchange information and work with DOS, Windows, OS/2, and Apple II ProDOS disks and data files. MacTCP – Already the most networkable machines on the market, Apple computers take another step to total connectivity with on-board support for TCP/IP, giving you simplified access to UNIX systems and Internet communications. Other major enhancements had focussed on improving power management and usability for PowerBook laptops, and implementing QuickDraw GX. 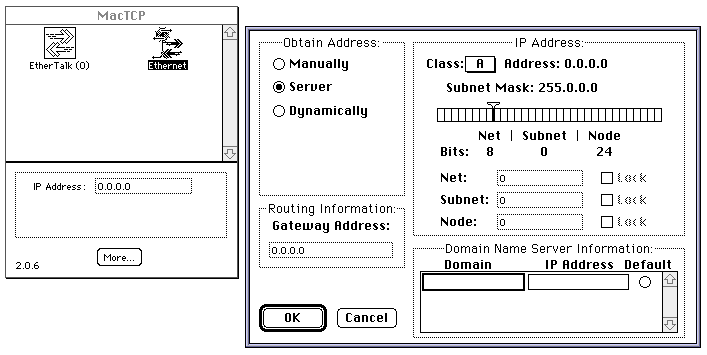 QuickDraw GX was the replacement for the original QuickDraw API that had been in use since the 1980s. Presenting the operating system and objects on-screen, typography, colour management, and printing comprised its core functions. Particularly for printing, GX was a case of too little too late in a world dominated by PostScript, and so it was largely ignored by consumers and developers. Apple announced on March 3, 1997 that it will resign the use of QuickDraw GX for its printing architecture in future operating systems. Also available was QuickDraw 3D, though upon Steve Jobs return in 1998 was quickly killed off and replaced with OpenGL. 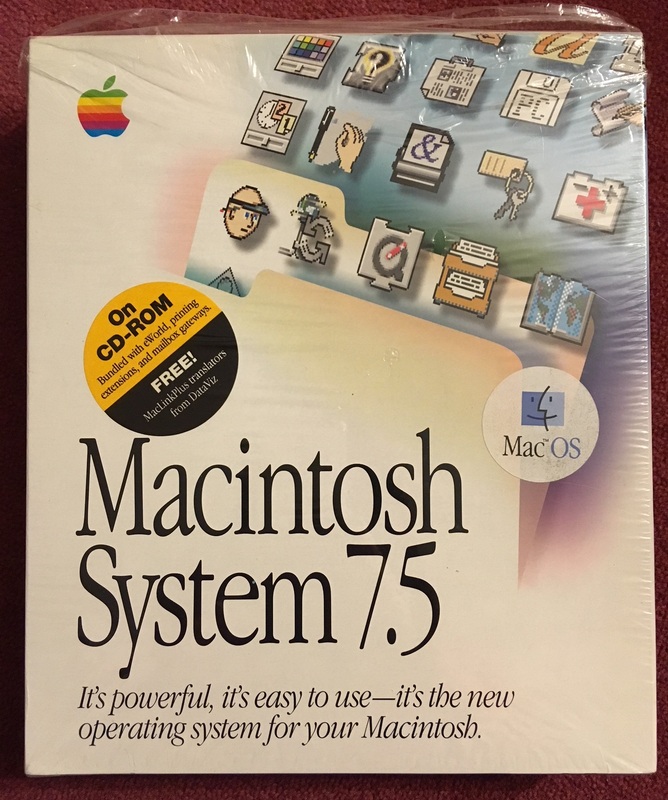 This was to be the final operating system before Copland was to take over, originally to be known as System 7.7 but later renamed as Mac OS 8.0. 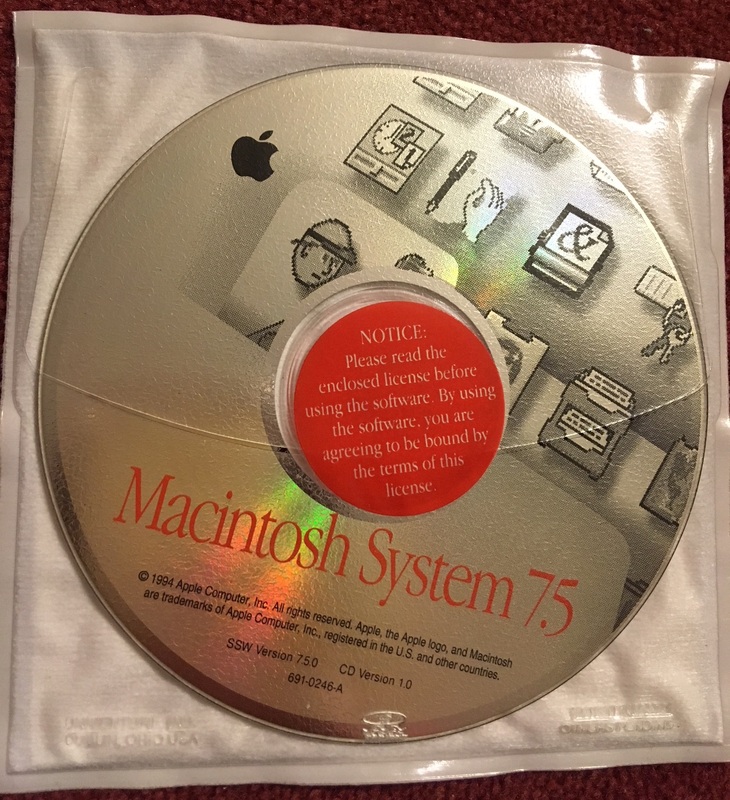 Instead in the beginning of 1997, we were given Mac OS 7.6. We won’t ever really know what would have happened if Steve Jobs hadn’t left Apple, or if he hadn’t returned from Apple’s purchase of NeXT, but there’s little doubt Mac OS development could have went in a completely different direction.